Savings. Why buy more plastic than you need? Better performance at thinner gauges means purchasing less plastic for the same job. Advanced Polymer Blends! Up to 14% natural materials. Non-petrochemical reinforcement additive. Savings. With enhanced durability and dependability, product failures become nearly obsolete, creating better workplace efficiencies. Savings. 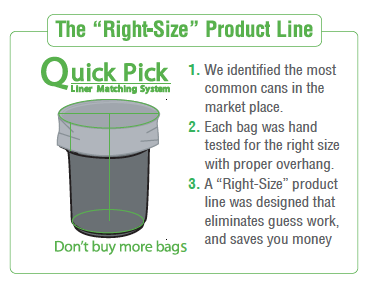 Eliminates the purchasing of oversized bags, and promotes product consolidation and SKU reduction. • Improves supply chain efficiencies – packaging and transportation, etc.